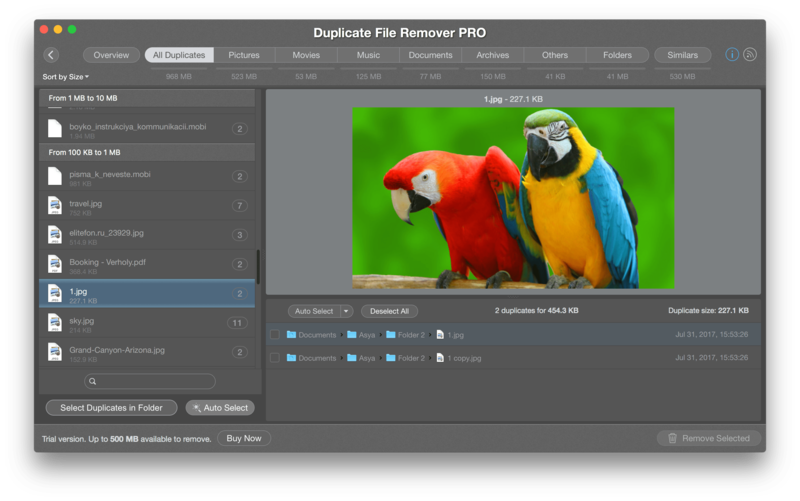 Duplicate File Remover finds duplicate files, folders and even similar folders – Similars. Choose any folder(s) and/or drives to search duplicates and press scan button. 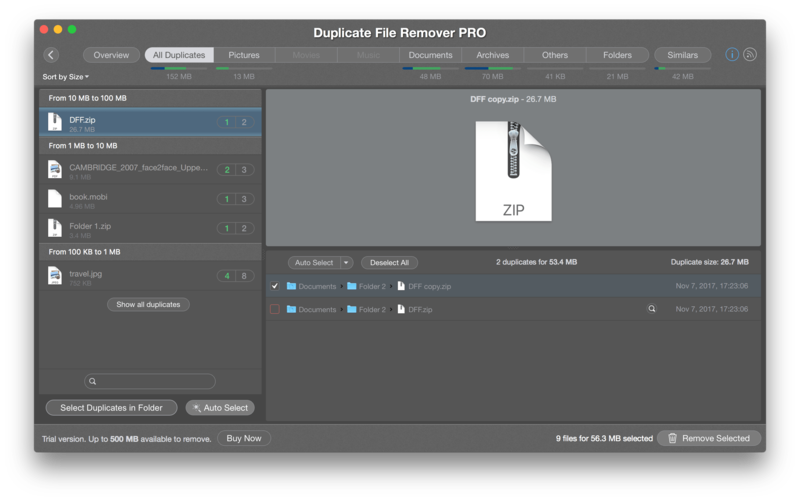 Right away, Duplicate File Remover will scan selected folder(s) for duplicate files and provide you with scan results. 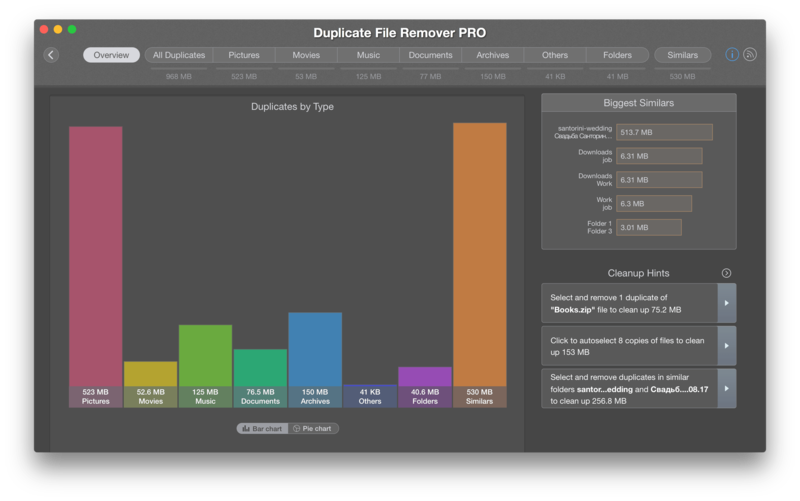 Duplicates Bar Chart shows how many duplicates among specific file types were found. Similar folders list shows folders that have some duplicate and some unique files the same time. Cleanup hints are specific recommendations for fast space cleanup. You can preview duplicates by a category, or just preview the whole duplicates list clicking on All Files category. The left column displays files list. The right column shows all duplicates for the currently selected file. 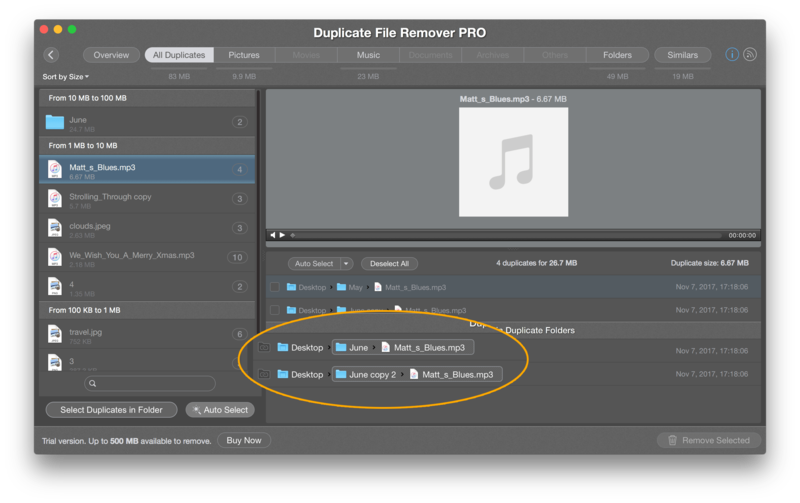 Here you can select a duplicate file for removal, tap the file to select it. When some files selected for removal, you will see a small progress that informs you how many duplicates you currently manage. This bar is convenient for you if you work with a list of big-size duplicates to see the scope of selected/unselected duplicate files. The green part of the progress reflects selected duplicates files size, blue part – original files size. For example, if you have 4 duplicate files of 2MB each, the whole progress represents 4*2MB = 8MB of size, if you select 3 duplicates of 4 for removal green part will represent 3*2MB = 6MB and blue part represent 2MB of space. Click on Remove Selected button to review selected files and confirm remove. Note: Sometimes you might have a file, that has a duplicate in some other folder, and the folder has absolutely identical folder duplicate. In this case, it’s probably better to search for folder duplicates first, and file duplicate later. To do that you can click on Go to folder duplicate Go to folder icon to preview and select the whole folder.